Electronic components inside control panels and monitoring devices need protected from cold temperatures. Control panels are often located outdoors and if exposed to sub freezing temperatures, components could fail to operate properly and potentially become permanently damaged. BriskHeat® TSREH enclosure heaters keep the control panel’s interior warm. TSREH heaters are silicone heaters pre-adhered to a steel plate. 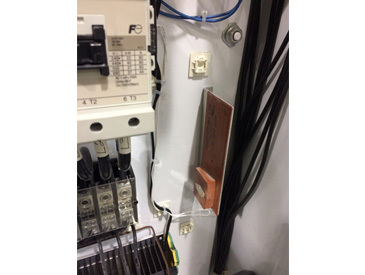 Easily mount the heater inside the panel using screws or bolts through the pre-drilled holes on the steel flange and make electrical connections. The plate-mounting ensures that the heater is installed where it is needed most and held securely in place. The steel plate also helps radiate the heat for maximum effectiveness. A built-in ambient sensing thermostat automatically senses air temperature and switches the heater on and off to provide easy worry-free operation. TSREH enclosure heaters have a small profile of only 2.5” (64mm) minimizing required space within the panel. Enclosure heaters are also used in a variety of outdoor cabinets and enclosures to protect cold-sensitive components. Examples include gate operation, parking garages, outdoor electrical panels, and more.